The results of Parliamentary Elections are very interesting. With 31% vote share BJP-Modi won 282 Parliament seats, Congress with 19% vote share got 44 seats, BSP polled 4.1 percent of votes and drew a total blank, the Trinamool Congress won 3.8 percent of vote share with 34 seats, Samajwadi Party won 3.4 percent with five MPs, AIADMK with 3.3 got 37 seats, Mamta with 3.8% of vote share got 32 seats while CPIM with 3.3 percent of vote share got nine seats. We should note that this time around Congress’s 19.3% votes translated into 44 seats while during last general elections of 2009 BJP's 18.5% had fetched it 116 seats. That’s a tale by itself, the crying need for electoral reforms which has been pending despite such glaring disparities which weaken the representative character of our Parliament. Many social activists have been asking for these reforms but in vain. Modi has been of course the flavor of the season and this time around it is being said that it was his plank of ‘development’ which attracted the voters to him, cutting across the caste and religious equations. How far is that true? Keeping aside the fact that Modi was backed to the hilt by Corporate, money flowed like water and all this was further aided by the steel frame of lakhs of RSS workers who managed the ground level electoral work for BJP. Thus Modi stood on two solid pillars, Corporate on one side and RSS on the other. He asserted that though he could not die for independence he will live for Independent India. This is again amongst the many falsehoods, which he has concocted to project his image in the public eye. One knows that he belongs to a political ideology and political stream of RSS-Hindutva, which was never a part of freedom struggle. RSS-BJP-Hindutva nationalism is different from the nationalism of freedom movement. Gandhi, freedom movement’s nationalism is Indian Nationalism while Modi parivar’s Nationalism is Hindu nationalism, a religious nationalism similar and parallel to Muslim nationalism of Jinnah: Muslim League. From the sidelines, RSS and its clones kept criticizing the freedom movement as it was for inclusive Indian nationalism, while Modi’ ideological school, RSS is for Hindu nationalism. So there no question of people like him or his predecessors dying for freedom of the country. 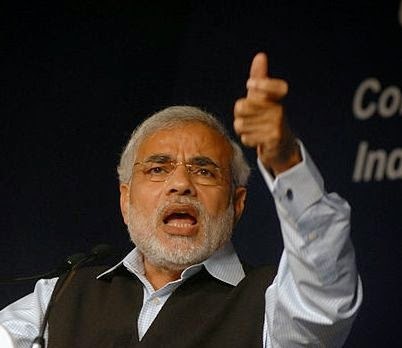 There are multiple other factors which helped him to be first past the pole, his aggressive style, his success in banking upon weaknesses of Congress, his ability to communicate with masses supplemented by the lackluster campaign of Congress and the Presidential style of electioneering added weight to Modi’s success. Congress, of course, has collected the baggage of corruption and weak governance. The out of proportion discrediting of Congress begun by Anna movement, backed by RSS, and then taken forward by Kejriwal contributed immensely knocking Congress out of reckoning for victory. Kejrival in particular woke up to BJP’s corruption a wee bit too late and with lots of reluctance for reasons beyond the comprehension. Anna, who at one time was being called the ‘second Gandhi’ eclipsed in to non-being after playing the crucial role for some time. Kejriwal pursuing his impressive looking agenda against corruption went on to transform the social movement into a political party and in the process raing lots of question on the nature and potentials of social movements. Kejrival’s AAP, definitely split the anti Modi votes with great ‘success’. AAP put more than 400 candidates and most of them have lost their deposits. Many of these candidates have excellent reputation and contribution to social issues and for engaging challenges related to social transformation. After this experience of electoral battlefield how much will they be able to go back to their agenda of social change-transformation through agitations and campaigns will remain to be seen. Many commentators-leaders, after anointing Anna as the ‘Second Gandhi’ are now abusing Gandhi’s name yet again by comparing the likes of Ramdeo and Modi to Mahatma Gandhi. One Modi acolyte went on to say Modi is better than Gandhi! What a shame to appropriate the name of Gandhi, the great unifier of the nation with those whose foundations are on the divisive ideology of sectarian nationalism. Coming to the ‘development’ agenda, it is true that after playing his role in Gujarat carnage, Modi quickly took up the task of propagating the ‘development’ of Gujarat. This ‘make believe’ myth of Gujarat’s development as such was state government’s generous attitude towards the Corporate, who in turn started clamoring for ‘Modi as PM’ right from 2007. While the religious minorities started being relegated to the second class citizenship in Gujarat, the myth of Gujarat development started becoming the part of folk lore, for long unchallenged by other parties and scholars studying the development. When the data from Gujarat started being analyzed critically the hoax of development lay exposed, but by that time it was too late for the truth of development to be communicated to the people far and wide. On the surface it appears as if this was the only agenda around which Modi campaigned. That’s far from true. Modi as such used communal and caste card time and over again. This was done with great amount of ease and shrewdness. He did criticize the export of beef labeling it Pink revolution, subtly hinting the link of meat-beef to Muslim minorities. This converted an economic issue into a communal one. Modi spoke regularly against Bangla speaking Muslims by saying that the Assam Government is doing away with Rhinos for accommodating the Bangla infiltrators. He further added that they should be ready to pack their bags on 16th May when he will take over as the Prime Minister of the country. The communal message was loud and clear. BJP spokesmen have already stated that these Bangla speaking Hindus are refugees while the Muslim is infiltrators. If one examines the overall scatter of the areas where BJP has won a very disturbing fact comes to one’s mind. While at surface the plank of development ruled the roost there is definitely the subtle role played by communal polarization. BJP has mostly succeeded in areas where already communal polarization has been brought in through communal or violence or terrorist violence. Maharashtra, Gujarat, UP, MP, Bihar, Assam all these have seen massive communal violence in the past. While the states which have not come under the sway of BJP-Modi are the one’s which have been relatively free from communal violence: Tamil Nadu, Bengal and Kerala in particular. Orissa is a bit of an exception, where despite the Kandhmal violence, Navin Patnaik’s party is managing to be in power. The socio political interpretation of the deeper relations between acts of violence and victory of RSS-BJP-Modi needs to be grasped at depth; the polarizing role of communal-terrorist violence needs a deeper look. While on surface the development myth has won over large section of electorate, it has taken place in areas which have in past seen the bouts of violence. Most of the inquiry commission reports do attribute violence to the machinations of communal organization. While overtly the caste was not used, Modi did exploit the word Neech Rajniti (Low level Politics) used by Priyanka Gandhi and converted it in to Neech Jati (low caste), flaunting his caste. At other occasions also he projected his caste, Ghanchi to polarize along caste lines. What signal has been given by Modi’s victory? The message of Mumbai, Gujarat, Muzzafrnagar and hoards of other such acts has created a deep sense of insecurity amongst sections of our population. Despite Modi’s brave denials and the struggles of social activists, justice delivery seems to be very slow, if at all, and it is eluding the victims. The culprits are claiming they are innocents and that they have got a ‘clean chit’. While there are many firsts in Modi coming to power, one first which is not highlighted is that, this is the first time a person accused of being part of the carnage process is going to have all the levers of power under his control. So what are the future prospects for the India of Gandhi and Nehru, what are the prospects of the values of India’s Constitution? Can Modi give up his core agenda of Hindu Nationalism, which has been the underlying ideology of his politics, or will he deliver a Hindu nation to his mentors? No prizes for guessing! Ram Puniyani's Article is read for his angle on the Events....He seems to have "some" bias & love for Old Nehru Congess Philosophy. India with its Hindu Majority has been ignored & its rights ignored at the cost of resricting those rights to give the "special" privileges to Muslims with the cover of the "minority" Eg Haaj Money, & Tax levy to Mandirs. There are Shikhs & Chritians as the Minority too. Nobody raises their concerns(if any)....In fact, India was established a "country for all irresepective of the caste,creed or the religion" It is the "fear" of the rights of the minority will be taken away (generated by the Politicians) that had fueled this "divide" and never brought out the "Bharatvasi" Tatva. Bharatvasi Tatva will be my ALL Hindus & should be by All NON Hindus too..This only will re-establish the real UNITY of India. Pakistan was formed as a "Muslim Nation"...The Hindus & others must be treated fairly....Are they really trated well ? On the other hand Hindu Majority India is for ALL of different religions. Modi is acussed as "pro-Hindu only"....His actions will say the Truth. May India prosper under his direction.